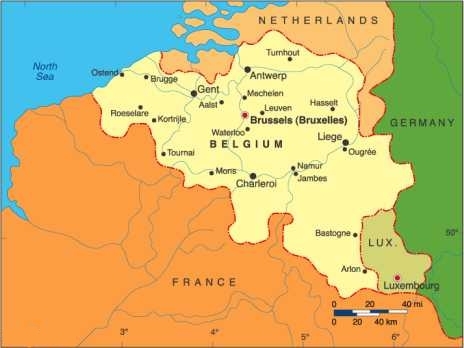 The city and municipality of Antwerp is a centre of commerce in Belgium and the capital of Antwerp province, in Flanders, one of Belgium's three regions. Antwerp's total population is ca. 461,496 (January 2006) and its total area is 204.51 km². The agglomeration has a population of about 800,000 (municipality: 461,496 (2006), metropolitan area: ca. 1,225,000). Antwerp has long been an important city in the nations of the Benelux both economically and culturally. It is on the right bank of the river Scheldt which is linked to the North Sea by the Westerschelde. Antwerp's port, which is one of the world's largest, has a high level of cargo shipping and oil refineries traffic, and in Europe, only Rotterdam's port is larger. Families of the large Hasidic Jewish community have traditionally controlled Antwerp's global centre of the diamond trading industry, though recently also Indian and Armenian traders became involved. In the 16th century Antwerp was noted for the wealth of its citizens ("Antwerpia nummis"); the houses of these wealthy merchants and manufacturers have been preserved throughout Antwerp. Fire has destroyed several old buildings in the city, such as the house of the Hansa League on the northern quays in 1891. According to folklore, the city got its name from a legend involving a mythical giant called Antigoon that lived near the river Scheldt, exacting a toll from those crossing the river. On refusal, the giant severed one of their hands and threw them into the Scheldt. Eventually, the giant was slain by a young hero named Brabo, who cut off the giant's hand and threw it into the river. Hence the name Antwerpen from Dutch hand werpen (hand-throwing). Another nice Belgian city Hui Chin and I spent a couple of days to explore, photograph and to get to know.